Amigo - Fish are Biting! Breezy morning but beautiful conditions this afternoon. We ended the day with double limits for our 12 anglers. We had 120 Rockfish, 110 Whitefish, 5 Sculpin, and 5 Sheephead! Book your spot today and let us share our fun with you this 2019 season! Check out our schedule at www.venturasportfishing.com or call (805) 676-3474. 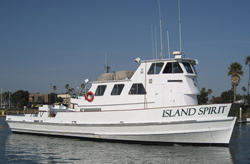 Be sure to like us on Facebook at Island Spirit Sportfishing, and follow us on Instagram @islandspirit805 so you can keep up with us! Hope to see you out on the water soon!